Contact Crispin Flower, or phone +44 (0)1874 713072. MapLink integrates database applications seamlessly with MapInfo Professional, ESRI ArcGIS and QGIS (Quantum GIS). Almost any custom-built database and all exeGesIS SDM software products can use MapLink to associate mapped features with database records. Filtered sets of records can be viewed on the map, and database records can be displayed for spatial selections made in the GIS. 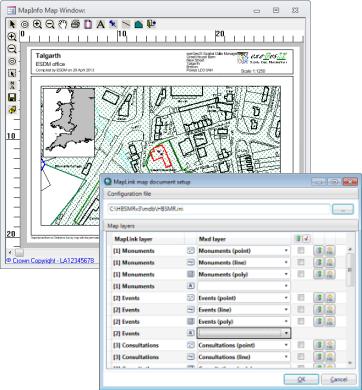 MapLink also includes a Multi-User Editor, extending standard GIS functionality to allow multiple users to edit the same spatial datasets simultaneously. MapLink can be integrated with your own database applications with the MapLink Developer Kit. Sample applications for VB6, VB.NET and Microsoft Access are included. MapLink support is provided via our dedicated consultants and through the MapLink documentation website (for registered users only).